The first sunrise of this visit to Kaua’i was spectacular. I watched the clouds retreat towards the horizon under the moonlight before dawn and when the day started to come, they were a heavy veil stretching up from the ocean. A few minutes after sunrise, the sun shone red through a thin spot in the clouds. For the next twenty minutes the sun broke free here and there while the waves kept crashing in and the sky steadily brightened. Nukoli’i Beach is a long stretch of sand along Kaua’i’s eastern shore. At this time of the year, the sun rises directly off the beach. When the clouds cooperate, the mornings can be exceedingly beautiful. This morning was exactly that. This entry was posted on December 1, 2012 by Christopher Martin. 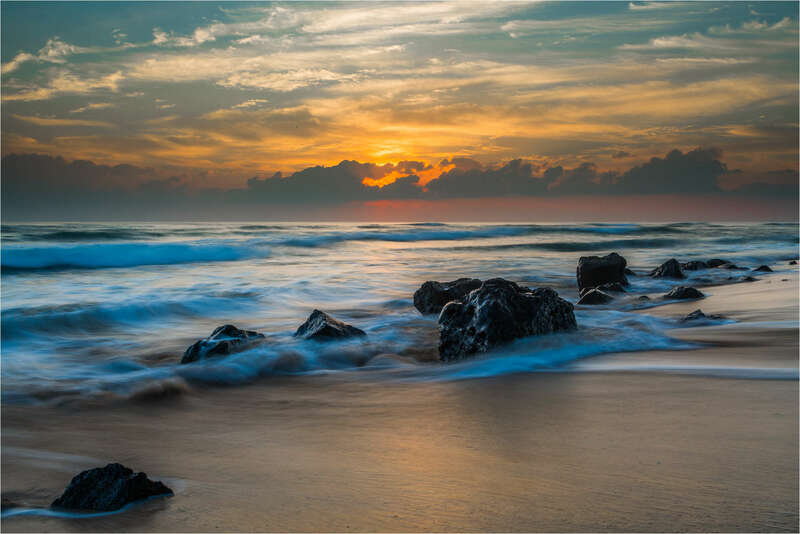 It was filed under Hawaii, Landscapes, Sunrise and was tagged with clouds, Hawaii, Kauai, landscape photography, long exposure, morning, nature, Nukoli'i Beach, Pacific Ocean, rocky beach, sunrise. Pingback: pastures in the sky. « Sick with Poetry. Thank you for giving me a new beautiful desktop background to enjoy every day. It is so nice when all the elements come together in a photo like this. This is fantastic! It’s almost surreal. No disrespect intended but it has the fine quality of a painting done by a good landscape artist. I like the fact that everything isn’t 100% crisp and clear. No offense taken – I hold artists who paint in the very highest regard. Thank you for the compliment. Oh, it’s so beautiful… Something between a painting and a photo – wonderful!